Underground film refers to films that have not gone through state censorship, cannot be publicly screened inside China, and can only be shown at film schools or “underground” sites such as bars. One underground film, Green Hat《绿帽子》, written and directed by Liu Fendou, offers an example of how the Internet provides a platform for the dissemination of materials that are not officially sanctioned and could become widely known in no other way. 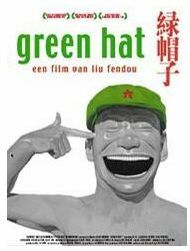 Green Hat won multiple awards at foreign film festivals, but only a fraction of Chinese film-watchers would have been paying attention to that. Today, Green Hat is available for download online, has multiple online reviews on sites like Douban and blogs, and even has a Baidu Post forum where readers openly discuss “green hat” situations (when a woman is cheating on a man), and the film itself. Even without any official media reviews or marketing, films like Green Hat can flourish because of online piracy and online word-of-mouth buzz. Hi Lyn. Gee, that Green Hat director–name sounds familiar. You wouldn’t happen to know him or something, would you? Hope all’s well with you and Tianyi. He still wearin’ the hair long? one only needs to engage ones attention to background scenes to get an idea of modern China.Even rural……..